We had big plans for Friday night – we were going to head down to the Blind Tiger for Les Enfants Terribles which I’d read was an early gig, then catch Yumi & The Weather headlining Juice FM’s night at the Haunt. But then it turned out that the Juice night was an early gig too which put pay to that plan. We also wanted to pop into Brighton Electric on the way home for their all night, but that didn’t seem like such a great idea with work in the morning. So we only made one of the three gigs we wanted to, but it was a good one. My New Favourite Tribe have only just put out their first single, but judging by the rest of their set there are great things to come. I would probably have enjoyed Salt Ashes set more had it been a PA in Audio at 2 o clock in the morning, but what a voice! I’ve been wanting to see Bent Cousin since I first heard them earlier this year and they didn’t disappoint. They’ve got catchy songs which work even better live than the recordings, and on top of that they’ve got heaps more charisma that most local bands. Saturday night was more of a success, mainly because we had much more achievable ambitions for the evening. We only wanted to see the one band – The Space Agency – who were launching their new single Bombay Potatoes at the Horse and Groom in Hanover. The Space Agency are another band who’ve been on my wish list of bands to see for a while, and they were fantastic. I don’t get to write about Surf Rock nearly enough on the blog, and the band – who also rotated instruments midway through the gig and played a set as their alter ego The Get Smashed – had talent and tunes in great abundance. New State Masses are a new band formed from the ashes of previous projects foiled by the machinations of the music industry. So far there’s only a few tracks up on Soundcloud, and we rather like the mournful Somehow, Someday which we’re featuring here, but they’ll have a single out later this year called Keep The Love which we’ll tell you more about as we hear it. Last Heir‘s new video was filmed down on the beach, and it looks like it was on the nudist beach, although they’re all fully clothed. Monkey Heart is a catchy slice of guitar pop, which is available as a free download if you follow the link underneath the video. We wrote about Gudjohr‘s last EP back in February. In Tandem is his new seven track mini-LP, which is a bit less acoustic, but no less endearing. It’s available as a name-your-price download on Bandcamp. Wake Up by My New Favourite Tribe was released this week and is out on iTunes and the other usual suspects. It’s wonky electro pop, not a million miles from Hot Chip, or early nineties synthpop band Beloved. 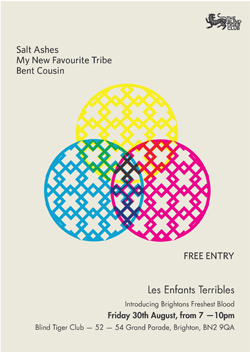 My New Favourite Tribe play at Les Enfants Terribles at the Blind Tiger this friday. Bright Lightbulbs is King of Cats’ contribution to a new split single with Ides coming out on 9th September on Reeks of Effort. It’s a bit lo fi and a bit like marmite – you’ll either love it or hate it. You can go and watch the video over at The Line of Best Fit – As much as I try I haven’t been able to embed it here! Finally we have a video from Flash Pan Hunter. Overcome Love With The Devil is a stripped back acoustic version of the original which is on his new album Quick Way To Enemy which came out a week or two ago. The video was filmed at Tim Bidwell’s Clockwork Owl Studios up in Kemptown. It seems a bit early in the week to be posting up our regular weekend gig picks post, but we normally do it on a Wednesday, so here we are. Tomorrow night’s gig pick is House of Hats, who are supporting alt folk legend Mark Mulcahy at Latest Music Bar. There a loads of great gigs on Friday night – Les Enfants Terribles put on one of their regular gigs at the Blind Tiger with Salt Ashes, My New Favourite Tribe and Bent Cousin. Juice FM also have an all Brighton bill at The Haunt, with Yumi & The Weather, Astrid’s Tea Party and Bella Feud playing. Meanwhile Brighton Electric are holding a summer party, with Dog in the Snow, Jungfrau, Momotaro and Dissonants. Saturday night’s choice is The Space Agency who are launching their new single Bombay Potatoes at the Horse & Groom.